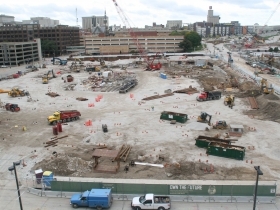 New Bucks Arena Construction. Photo by Jeramey Jannene. 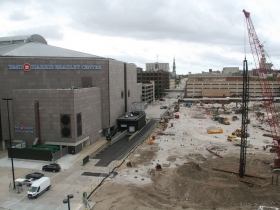 Work is well underway on the new arena for the Milwaukee Bucks, as well as a bunch of auxiliary buildings that will tie into the complex. 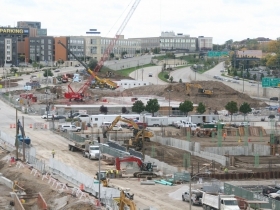 The $524 million construction project, led by Mortenson Construction, is so big that the construction site even has a naming rights sponsor, Milwaukee Electric Tool. 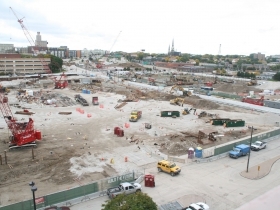 In addition to the $485.9 million, 714,000 square-foot arena, work is underway on a new training facility for the team and a large parking garage. 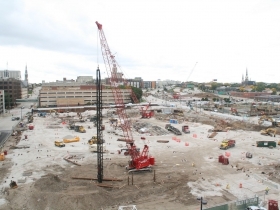 The development is being dubbed the Wisconsin Entertainment and Sports Center. This edition of Friday Photos was primarily captured from the top floor of the 4th and Highland Parking Structure. That view is soon to be gone though, as tenants were required to remove their vehicles from the building as of 6:00 a.m. this morning as part of the demolition process. 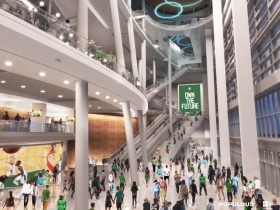 The garage will be replaced by the “Live Block” development, an entertainment complex located across the now-closed N. 4th St. from the arena. Design work on the entertainment complex is being led by Rinka Chung Architecture and has yet to be revealed. It will require design approval from the city before construction. 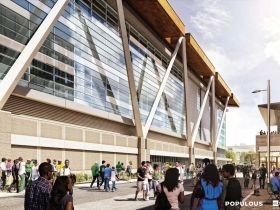 As part of the multi-layered arena financing deal, the city deeded the garage over to the Milwaukee Bucks development arm Head of the Herd and will contribute, via tax-incremental financing, funds to build a new $38.1 million parking structure at the northeast corner of N. 6th St. and W. Juneau Ave. 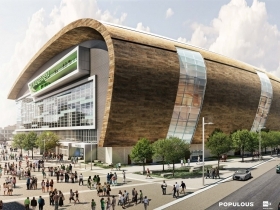 The Bucks and city will split revenue from that structure. 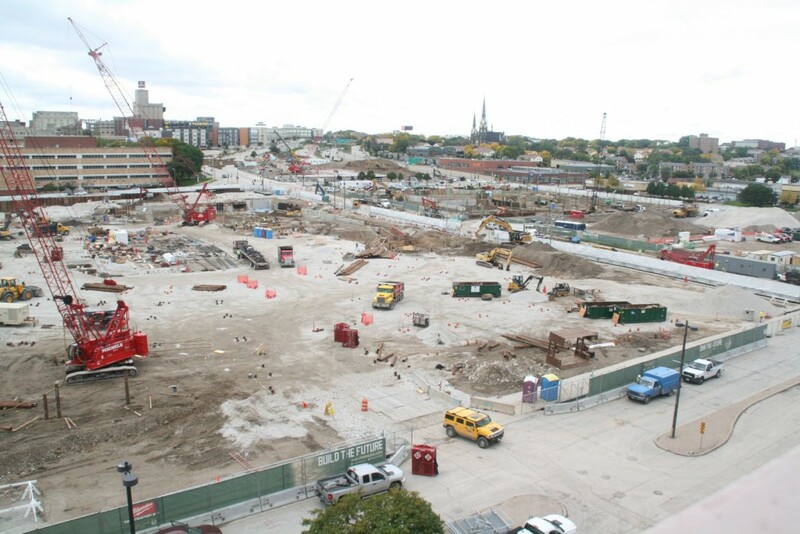 As our photos capture, the foundation for the new structure appears to be further along than the new arena. Also under construction is the privately financed training facility on the northwest corner of N. 6th St. and W. Juneau Ave. 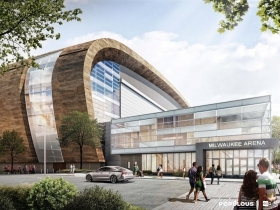 The Bucks recently announced a partnership with Froedtert and Medical College of Wisconsin to open a clinic in the 37,000 square-foot office building attached to the team’s privately-financed $30 million training facility. The $10 million Froedtert and Medical College of Wisconsin McKinley Health Center is scheduled to open in the fall of 2017. 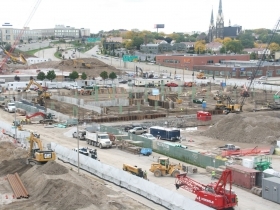 The training facility is expected to open next August, a season ahead of the new arena. 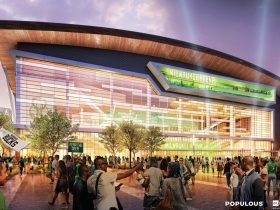 The costs of those facilities are not included in the total cost for the arena complex. 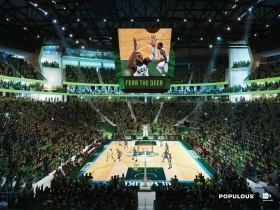 One bit of arena-related news that hasn’t developed as expected is the apartment building that is planned along N. 6th St. During the zoning approval for the parking structure, Bucks president Peter Feigin noted that the Bucks would like the privately-financed apartment building to be constructed simultaneously with the new parking garage. The apartment building is intended to mask the garage and will be built immediately west of the new structure. Should that project ultimately materialize it will require additional design approval from the city, until then the western side of the garage is planned to include a few minimal design treatments. Design work on the complex is being led by Kansas City based Populous, with assistance from Eppstein Uhen Architects and HNTB.